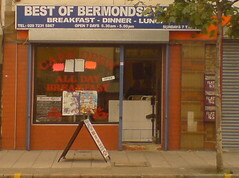 Greasy spoon on Grange Road in Bermondsey. secretlondon visited in September 2008 and had a mixed grill (£4.80) (photo) and a coffee (80p) (photo). There was music on a television. secretlondon visited in October 2008 and asked for the lamb special mentioned on the board in the window. It was supposed to be lamb, rice and salad and arrived after 30 minutes as lamb chops, chips and tomatoes photo. The lamb was fatty and poor quality. Accessibility: Steps to enter, and steps down to the toilet. Last edited 2008-10-11 18:10:28 (version 7; diff). List all versions. Page last edited 2008-10-11 18:10:28 (version 7).